"Before you were conceived, I wanted you. Before you were born, I loved you. Before you were here an hour, I would die for you. The baby...THIS IS the miracle of life. The moment my baby was born, I said to our doula, "I never knew this kind of love existed." It is a kind of love that only a parent has for their children. I was never much of a baby person, before babies, that is. Then, when I was pregnant with my first baby, I found everything about the mystery of babies fascinating and utterly awe-inspiring beyond anything else....from each stage of the pregnancy to the time of birth to soaking up every second of the newborn days with my children. I have two beautiful, healthy, outgoing, happy children and an amazing husband. I am so, so happy in my life right now — it’s the kind of happiness when you look around and realize, this is it. I have everything I’ve ever wanted. And you start to wonder how long it will all last. Because the honest truth is I'm afraid of what comes next. I'm afraid of a life without the delicious weightlessness of a newborn in my arms. I'm afraid of a life without the sweet milk breath of an infant. I'm afraid of a life without the sweet innocence that I see reflected in my daughter's big brown eyes. I'm afraid of the unmerciful speed at which time tugs on my children to urge them to grow and change more quickly than I can blink. I'm afraid, simply, to move on from the days of babyhood. I'm afraid, because before me is the rapid transforming days of watching my children grow up at lightening speed right before my eyes, seeing dimpled toddler limbs change into thinned out walking legs, garbled words mispronounced, sentences spoken grammatically incorrect...all replaced by startlingly clear, articulate words and formulated thoughts. I see with blinding brightness, the happiness, this time of babies nesting near, days spent around nap times and stories and coloring and play time, safe in our cocoon at home. I see that this is the best time of our lives. And, I fully believe that with all my heart. ....how, then, do I leave it all behind? Out of this reflection on babies, growth, and change comes a creation made from a slightly different "fabric of life." This one is made of threads of life that pull at your heart and soul and make them ache and jolt because it is inspired by the one true miracle of life...the baby. And from the baby is born the parent....a privilege and a responsibility so great that one must endure heartache like no other kind of heartache and experience love that exists like no other kind of love. With all that said....I present to you....Baby Erminka. Although she is inspired by the one thing in life that currently brings me great angst and sadness (the rapid pace at which children grow), Baby Erminka actually represents the greatest joy that life can offer...a baby to call one's own. Baby Erminka is the first of her kind....a 6" Wee-Bee Baby Elfcup. She stands less than 6" (15 cm) tall. She is made with all natural materials. Her doll skin is made with premium quality cotton interlock imported from Europe. She is firmly stuffed with bio-wool made in the US. Her seams are sewn twice for reinforcement. Her locks are made of mohair yarn tied into two wispy baby pigtails. She has embroidered facial features. Her facial structure is sculpted giving her a sweet little face with a happy smile belonging on that of innocent infants and toddlers. Her cheeks, nose and various body parts are blushed with red beeswax. She is a sitting doll with permanently bent knees that allow for a very open sitting position and she has sewn joints that are made flexible for easy movement and changing of clothes. She also has a belly button and a bum. Baby Erminka comes capped with an over-sized hand knit hat made of a silk-mohair-wool blended yarn by Noro of Japan and trimmed with a blend of suri alpaca, mohair and silk yarns. Her baby onesie is made of a 100% cotton knit fabric and decorated at the collar with a hand knit trim made from a 100% alpaca yarn. The onesie opens fully on the front with three nickel-plated brass snaps. Her shoes are hand knit and made of a cashmere, silk and wool blended yarn by Superior held along with a mohair-silk yarn by Rowan. Baby Erminka comes cuddled up with a tiny teddy by the name of, simply, Ted. Ted is the smallest head to toe hand knit creation I've ever made. 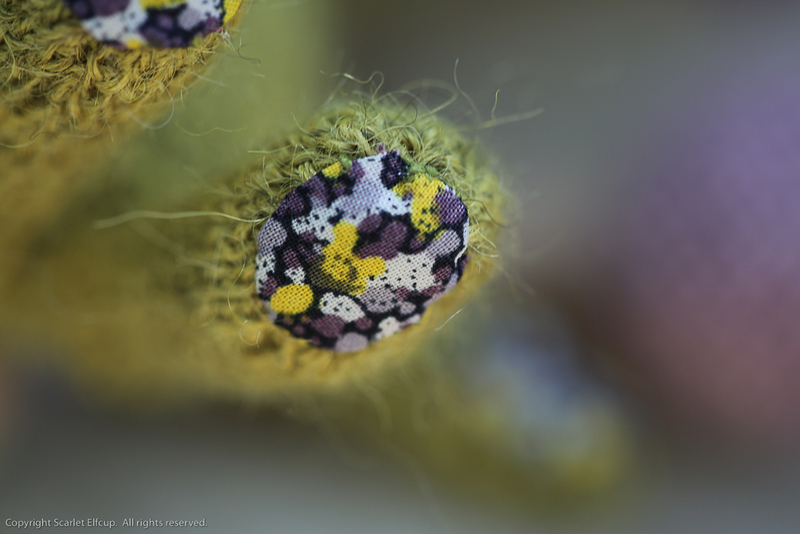 He was hand knit with a lot of love and joy from a 100% alpaca yarn and stuffed with 100% wooly innards. His sweet little bear face is embroidered with 100% cotton floss. 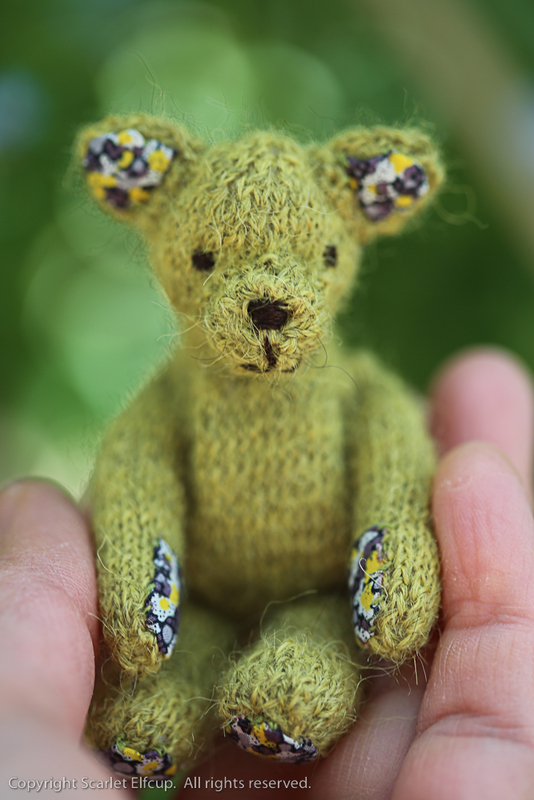 His ears, paws and feet are padded with sprinkles of Liberty of London 100% cotton fabric. Here's to the joy of being parents...a privilege and responsibility born out of the miracle of life....presented to you in the form of Baby Erminka and Ted. Scarlet Elfcup is honored to be participating as a guest with The Enchanted Toybox for their May upload coming this Friday, May 1. 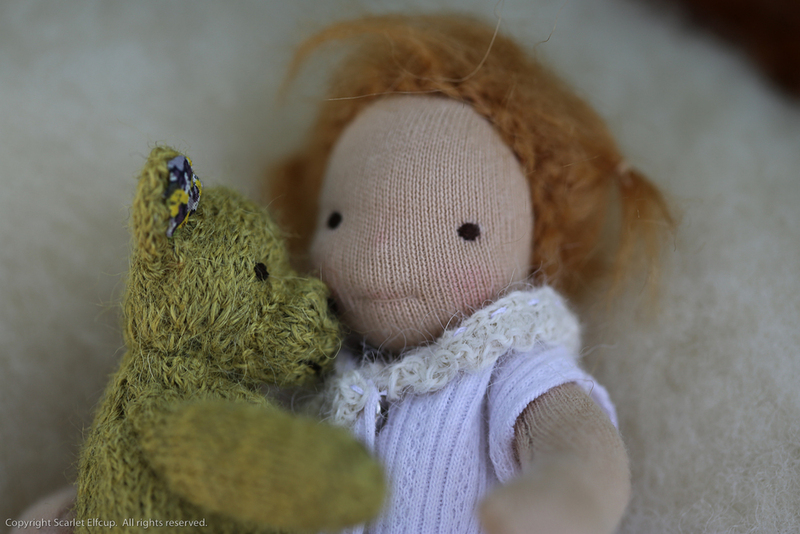 Baby Erminka and Ted will be available through The Enchanted Toybox upload. More details to come during the course of the week and announcements regarding Baby Erminka and Ted's availability will be made through Scarlet Elfcup's blog and Facebook page. I would like to send a heartfelt thank you to Angie Fahrenkopf of Violet and Poppies and all the makers of The Enchanted Toybox for giving me this unique opportunity to partake in the pool of beautiful creations produced by all the amazing talent at The Enchanted Toybox. It is truly an honor. Thank you so much. More to come soon. Thank you and have a lovely evening.